Her images have helped define Melbourne’s identity, but artist Deborah Halpern shies from taking herself too seriously. This is the sort of day Melbourne needs Deborah Halpern. Grey flows out of the National Gallery’s bluestone walls and down St. Kilda Road to the wet, grey city. It seems the rain would wash away all the color of the day were it not for Halpern’s Angel. The Angel, a sculpture as bright as it is beautiful. It jumps out of the Gallery moat and demands that Melbourne smile. Smile you must when you visit Halpern. 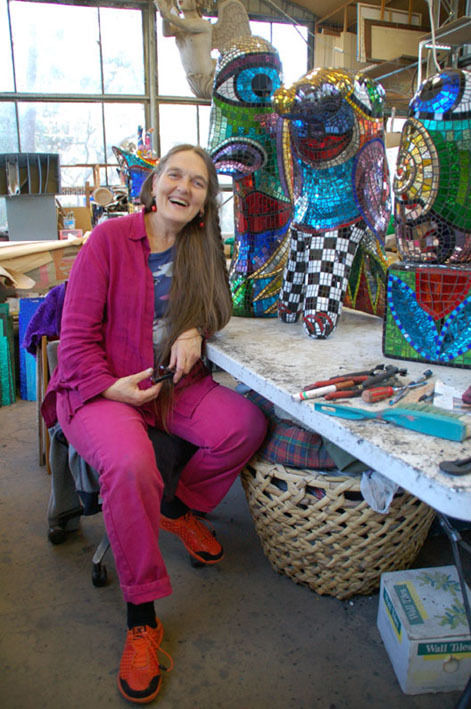 The faces of her sculptures may grimace or stare, laugh or meditate but they also tickle the spirit. Here is a cat’s face on a wavy plant stem, here a heart or a striped triangle, each of them growing on rusted metal, sculpture flowers bright as the marigolds. Here is another angel, flying from the ceiling of her studio. Here is a series of vases waiting for flowers. Their double faces are so friendly it seems the studio is filled with people, though there is only Halpern and me, and a neighboring sculptor, Ange Nagel, painstakingly cutting ceramic tiles. Halpern smiles easily. She greets me laughing at the muddy bottom of her steep Warrandyte driveway, cursing her neighbors’ insults to the bush but unconcerned about the mudslide which forces her to take a couple of runs in her battered van before she makes it through the overhanging gum leaves into what is half a sculpture garden and half an outdoor workshop. Her home is dominated by the studio, as is her life. She finds herself working in her pyjamas. She went through a recent state of doing a painting every morning before breakfast – until the good paper ran out. 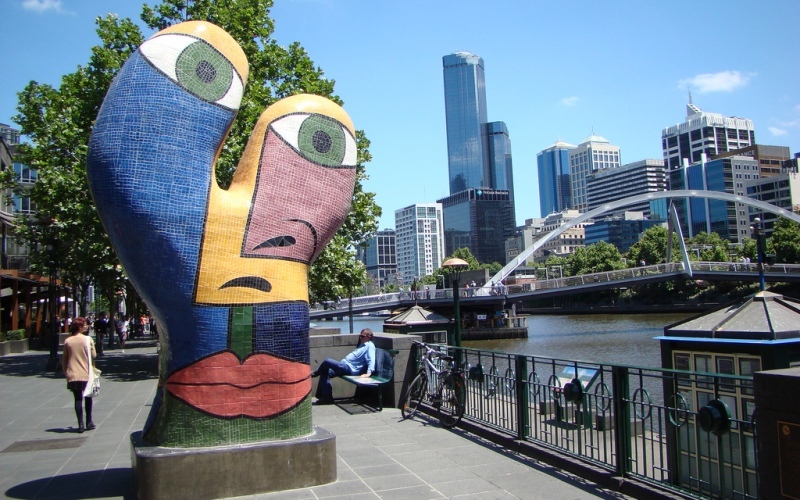 Halpern is one of Melbourne’s most successful artists; the Angel is one of the city’s best known sculptures. Her Southbank sculpture, Ophelia, last year became the basis for Melbourne’s tourism image. But art still doesn’t make much money and what she has she spends on buying art or employing other artists. Perhaps it was inevitable that Deborah Halpern would live this way. Having no money seems to go with the territory of being creative and choosing your own life, of dripping Warrandyte gums and great art in the garden, of conversation splattered with laughter and studio floors spattered with paint. Her parents were hippies before there were hippies. Sylvia and Artur Halpern were among the founders of Potters’ Cottage and with her better-known uncle Stazek Halpern and their friend Inge King formed a community that allowed young Deborah to grow up knowing you could choose the way you wanted your life to be. Early on she wanted to be a writer and started making pots at the suggestion of her parents to “support the writing habit”. But ceramics must have been in her blood. Eventually she acknowledged she was a potter. Much later – it took a long time – she even learnt to call herself a sculptor. “The work I did was always sculpture. I wasn’t content to make pots, I’m always adding things onto them. My dad used to say just get your color and just go swish swish and I’d get this bowl that was only going to sell for $6 and I’d do a face and an animal and then I’d do the outside and he would despair because I wasn’t going to make any money and he was right. Even when she was making pots and bowls Halpern couldn’t contain her originality. Making two things the same seems a burden. Useful. It’s a word that crops up persistently as we discuss Halpern’s work. The sculptor may have dumped the functional teapot spout but she still feels things must be useful. What does it mean to her for an artist to be useful? “Uplifting and optimistic and life-affirming. That’s what I think is useful. I don’t think to be self-indulgent and wallowing in misery is particularly useful because we can do that anyway. So we are right. Right to smile when we drive past the gallery and to be tickled by the audacity of her colors. Halpern smiles too. She waves or winks at Angel when she’s in town but she insists, the sculpture is as much ours as it is hers. Halpern uses the word “thrilled” a lot. Also the words good, great, exciting. She’s serious but never grave. She laughs frequently and deeply. She refers to her work on a sculpture that graces Highpoint Shopping Centre as “a joyful time”. She seems to swallow life in big enthusiastic gulps. Her home, built by her ex-husband and now shared with her partner, sculptor and welder, Malcolm Laurence, seems to spill out. We walk through her studio and garden, following the process that goes into her work. Scattered on her huge work table and on odd shelves and window sills are pocket versions of the sculptures modeled in clay and crudely painted to give her a quick feel of shape, color and ideas. Then it’s outside, where sheltered among the broken tiles, half finished possibilities, old ginger bottles and wayward geraniums there are wire shapes, like distorted coils of chicken fencing, the cores of sculptures in waiting. Next to them are more solid lumps, versions covered in builders’ foam which Halpern carves. Up the slope past a couple of spheres that look like a grey snowman standing sentinel at the top of the drive is a shelter she uses to coat fibreglass over the foam. She does all the sculptural work on the smaller sculptures but a model of larger works is sent to an engineer. Halpern still works in clay and concrete as well but she prefers the tile on fibreglass process because it makes her sculptures durable. Kids can sit on them and dogs can leap over them and it doesn’t matter. She has her favorite pieces, though they change. Now she is missing a couple of large sculptures that have gone to a gallery after sitting in her bush garden and becoming makeshift weather vanes. There’s nothing she wouldn’t sell. If someone likes something enough to buy it, that’s as good a reason as any they should have it, she reckons. And quite apart from the money, she wants to be able to let go and let her work have a life of its own. She is also starting to think about ways to shape Melbourne beyond her own work. If she can create icons and images maybe, she is beginning to wonder, she can make things happen. So she’s started to think about creating an artistic event for Melbourne, a festival where artists could set up shop on Swanston Street, work alongside one another and create works for the city in process. 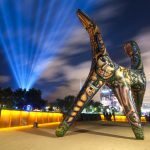 It’s just an idea now but the Melbourne City Council says that type of visual arts event is on its drawing board. They would certainly be hard pressed to find anyone to run it with greater enthusiasm or belief in the ability of art to improve people’s lives. And watching Halpern work would have to be a pleasure for Melbourne. She so obviously enjoys herself that it is contagious. © 2015 The Age | This article first appeared in The Age on 18 May 1997.